This week, Bright Eyes was excited to partner with the Valspar PGA Tournament and EnChroma color blind glasses to help a young golf fan! 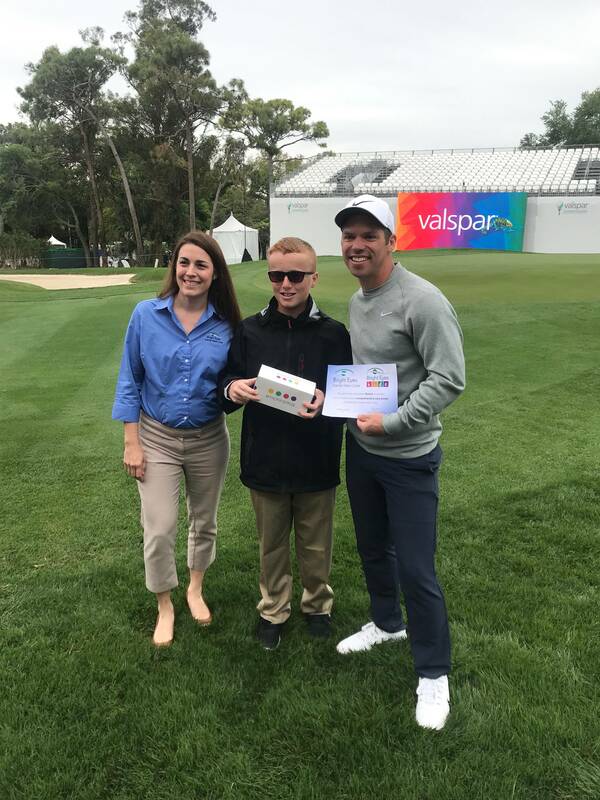 Bright Eyes optometrist Dr. Beth Knighton had the pleasure of assisting 2018 and 2019 Valspar Championship winner Paul Casey surprise her patient Ronan with a new pair of EnChroma glasses for color blindness. Ronan and his family were so excited to visit different behind-the-scenes tour stops, get autographs from players like Patrick Reed and Sergio Garcia, and the surprise of a lifetime – to play the 18th hole with 2018 Valspar Champion, Paul Casey. At the end of the hole, Paul pulled the EnChroma glasses to gift to Ronan, along with a complimentary eye exam from Bright Eyes Tampa presented by Dr. Beth. Then the tournament director presented five gallons of Valspar paint to transform Ronan’s room into his “new” favorite color. Here is an article and video by the PGA about Ronan’s time with Paul Casey and getting the EnChroma glasses. EnChroma glasses can help 4 out of 5 Red-Green colorblind patients enhance color discrimination. Bright Eyes in Westchase carries several styles of EnChroma, including sunglasses and indoor tint glasses. Patients can try on the glasses for themselves before buying. It is so exciting to help patients see a more “colorful world”! If you would like to try the EnChroma glasses for yourself, call for an appointment with one of our experienced Optical Staff, and we will be happy to answer any questions. Bright Eyes was very happy to help make this a special experience for Ronan and his family. Dr. Beth had a wonderful time at the Valspar PGA tournament! If you have any questions about EnChroma glasses for colorblindness or sports vision, please call us at 813-792-0637.